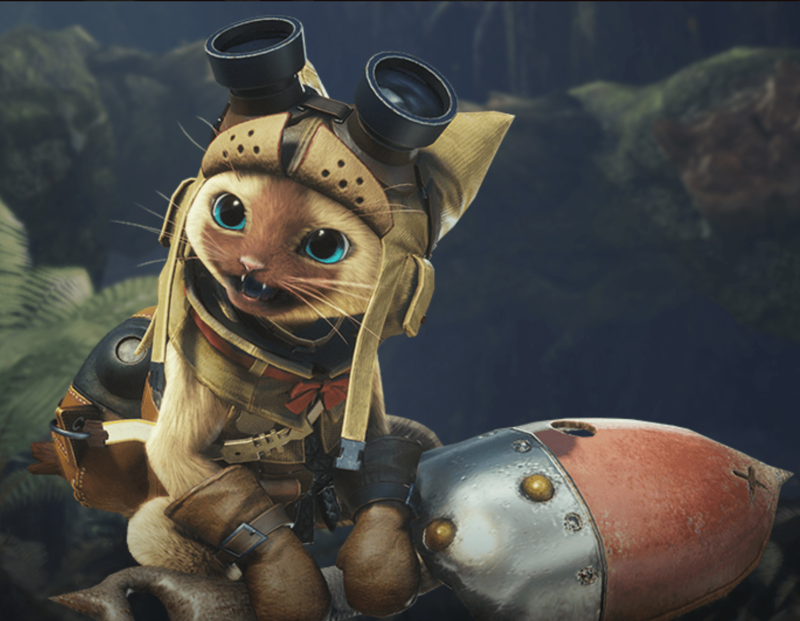 Monster Hunter newbie DAMIAN REID gets hooked into the fifth installment of the franchise – just don’t be picking on his Palico! To start with I must state that I haven’t played any of the other games in the Monster Hunter franchise so Monster Hunter: World, which is the fifth installment, is my introduction. Like many action RPGs you begin by designing your character’s look. I created a guy who looks like a steampunk version of Geralt of Rivia. You also have to design a Palico which is your cat-like companion. To say that I spent three times as long designing a cute cat than I did designing my character would not be a lie. Don’t judge me, because Azriel is the cutest Palico ever and I will fight anyone who says otherwise. The opening sequence sees you and a veritable army of other hunters and support staff in pursuit of a big bad dragon, sailing to a place believed to be the source of this and all the other monsters that have been plaguing your home for the past four games. Surprise, surprise something goes wrong and you end up in the water and have to make your way to shore, find a friend or two and then to the base camp of the fleet who went before to recon and set up a foothold. The base and subsequent game play has a World Of Warcraft feel to me and with the importance of crafting, gathering resource and a fun fishing quest I was starting to think that this MMO would just be the same as WOW. At first all the ‘monsters’ were mostly vegetarian dinosaurs and I felt bad for slaughtering them for some pretty flimsy scientific reasons. However, as I learned to craft weapons and armour for myself and my Palico I started to realise that with 14 different weapon types and several armor types for my cat alone that I was going to like this game. The menus are pretty complex and daunting at first, but with time and perseverance you can figure them out, and now that the game has a lot more players you can also get a lot of help online as well. Crafting, upgrading and learning new combos for each weapon makes switching weapons almost like playing a whole new character class and this keeps the game fresh. Add to that the fact that the monsters are varied in their attacks and weaknesses and World becomes a fun, challenging game. The story plot is a bit weak, but the new challenges that each monster brings does help drive you on to complete that next quest. You also have a helpful swarm of Scoutflies who lead you to tracks and eventually that next monster you need to get the items to build the armour to protect you from whatever nasty thing will be sprayed at you. The combat system is a bit clunky at first, and not as free flowing as we have come to expect with modern games, but as you learn and gain experience it gets much better. Master those combos and you will become a Monster Slaying Machine. The graphics are good and the artwork brings to life the characters, monsters and environment superbly. Overall a very good looking game that helps immerse the player into the monster world. The mini games and side quests really add to the World feel of this game and become important if you really want to complete that butterfly armour for your Palico or the Felyne Iron sword or the kulu lute. Yes you do spend a lot of time making things for your cat. You also fish, cook, harvest mushrooms, mine and many other things which gives the game some nice layers without becoming too arduous. Now to one of my least favourite aspects of the modern gaming world. WOW and Destiny are two games that spring to mind and light the fire of my dislike of having other people crucial to completing a game. WOW because without additional players a lot of the game is closed to you and Destiny because you jump past story cut-away scenes and sometimes will warp straight into a boss battle that someone else is involved in as part of the quest, so you miss part of the game itself. Monster Hunter: World is nothing like that. Whether you and three of your friends get together to kill that huge beast that has been blocking your way to the next quest or you send up an SOS and three random players rush to your aid, the move from solo to multiplayer is pretty seamless and the voice chat means you can communicate and achieve your team goals pretty quickly. With a smaller group it is easier to coordinate and then you split up and go about your business as a lone wolf once again. You will need to put a whole lot of hours in to really get the full experience of Monster Hunter: World, but it’s worth it. Now if you will excuse me I need some poison quills so I have to go kill me a Pukei-Pukei.